RECOM's latest 15W and 20W AC/DC power supplies are designed for low power IoT and household applications. Based on the footprint of the compact RAC10-K modules, these new modules feature high-efficiency over a wide load range and minimal standby power consumption. 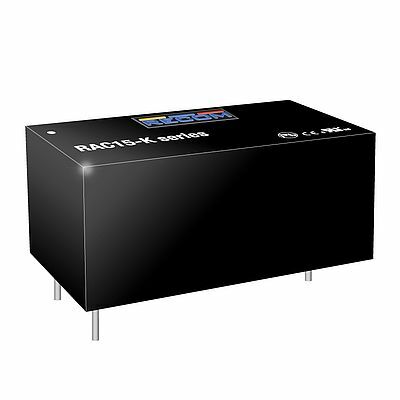 The RAC15-K and RAC20-K Series are PCB-mount AC/DC modules with ultra-low energy losses especially in light load conditions. Below 75mW, they have no load power consumption. This makes them ideal for the always-on and standby mode operations needed for IoT and smart home devices. Based on the latest integrated power design, these efficient power supplies deliver 15W or 20W of power in a modular 2”x1” case size. The AC/DC converters have a universal input voltage range of 85VAC to 264VAC for worldwide use and carry international safety certifications for industrial, AV (audio/video) and ITE (IT-Equipment) as well as household standards. Both the RAC15-K and RAC20-K devices have an operating temperature range of -40°C to +80°C and offer fully protected 5VDC single outputs. They meet EMC class B far below the limits without the need for any external components. The complete range of single output (5 - 48VDC), dual output options (12 and 15VDC), and wired versions will be available in the fall of 2018. Target applications include smart homes and smart offices, building automation, security & communication systems, door access controls, remote sensors and actuators, climate controls, touchscreen interfaces, and garage door-openers.